Thank you for visiting our web site. We hope your online experience with us will show you who we are, why we are here, and how you & your family can become a part of exciting things God is doing at MCBC. Better yet, we would love to have you visit us in person soon. You will find a friendly, casual atmosphere where you are encouraged to connect with other believers, worship God, find a place where you can serve, and grow in your Christian walk. Our blended worship style is a mixture of newer songs, choruses and hymns. Service times and directions are provided on this page. Come. Connect at MCBC. 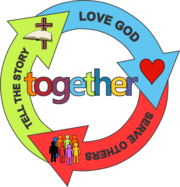 Love God, Serve Others, Tell the Story, Together! Office Hours: Monday - Thursday 8 a.m. - 3 p.m.
Click on Sermons Tab above to listen to sermon series.